Sorry, just as I have a hard time relating to a closet queen in person I have a hard time relating to Delicious Closet Queen on my person. Delicious Closet Queen was created by perfumer Nathalie Feisthauer and contains violet leaf, iris butter, Atlas cedar, Indonesian patchouli, Haitian vetiver, dynamone, rose absolute, framboise irisée, sandalwood, leather, tonka bean, opopanax, benzoin, geranium, and citrus. The overall fragrance of Delicious Closet Queen reminds me of a make-up counter at a department store with its cosmetics-chemical aura. 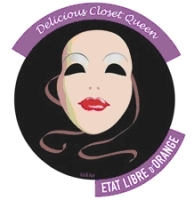 The ad copy for Delicious Closet Queen uses make-up imagery too (mentioning the closet queen’s ‘lip gloss’ and ‘compact powder case’) but that’s just another Etat Libre d’Orange disconnect: would a closet queen draw attention to himself with shiny tinted lips and a made-up face? Delicious Closet Queen starts off with a medicinal edge; it reminds me of the scent of Band-Aids (perhaps the closet queen has scratched his wrists?) As the well-blended fragrance rapidly settles into its “one-note” (and blurred) personality, I also detect a metallic violet aroma, a “cosmetic” rose scent, powdery, not buttery, iris and the teeniest bit of vetiver. As for the “iridescent raspberry” (framboise irisée) — it’s detectable and not overly “fruity.” I have never had the opportunity to smell dynamone in isolation, so I’m not sure if the sweet aroma that pervades Delicious Closet Queen is dynamone or just an accord produced by the cedar, tonka bean, patchouli and sandalwood. Delicious Closet Queen “crumbles” and turns powdery quickly; it’s very feminine to my nose and it’s a light, close-to-the-body scent — a true closet queen does not want to draw attention to himself! Always wanting to shock, why didn’t Etat Libre d’Orange scrap the timid (and confused) Delicious Closet Queen concept and create, say, Sometimes I Play Dress-Up — a fragrance based on the secret life of a six-foot, five-inch tall banker whose manhood is hard to hide in the skin-tight gowns he wears when his wife is not at home. Sometimes I Play Dress-Up could still contain metallic cosmetic aromas (hairspray, shave cream, nail polish, face powder, lipstick, talcum) but with an added, and generous, pouring of the wife’s Joy de Patou perfume: a tiny ‘rivulet’ of Joy would take us on a scented journey as it travels from our banker’s neck, down his hairy chest and stomach and into the territory of serious odeurs viriles that no make-up, costume or attitude can fully camouflage. I’d prefer such a brash fragranced bomb to the prim “scented envelopes” of Delicious Closet Queen. Wouldn’t you? Etat Libre d’Orange Delicious Closet Queen is available in 50 ml Eau de Parfum. For buying information, see the listing for Etat Libre d’Orange under Perfume Houses. Tomorrow: Tom Ford For Men. OMG. I want some of that I Play Dress-up, where can I get it?!?!? And I cannot WAIT to see the ad campaign, just the thought of the skin-tight satin gown … okay, inappropriate mental imagery, moving along. And what a wonderful description of Closet Queen, I think I'll pass. Haven't smelled it and really have no interest either. The name is way too campy to be taken seriously. If I did wear it, I'd be hell bent on saying the name, really. I agree, “Would a true closet queen want to draw attention to himself with a scent that smells of women's makeup?”. I think not. I don't even think that Senator Craig (I think that's his last name, I've almost forgotten about him now) would wear such a scent. Since he's a true closet queen. “I'm not gay” as he said to the press. Said as a man in true denial if I ever heard one. Okay, I'm sure I'll be told “I shouldn't judge others here if I don't know all the facts with this Senator”. Well, dearies, when there's smoke, there's fire. Denial is denial. Plain and simple. Okay, this isn't supposed to be a political rant since I hate politics. I generally do like this line, even though I think their obvious desire to shock sometimes comes off as trying to be a little too clever for their own good. But this is one that I have no interest in trying at all – I simply don't get it: What about being a “closet queen” could possibly be worth celebrating? I don't think there could ever be anything “delicious” about the concept of hiding and being ashamed of your sexuality. Yeah, celebrating a cross-dresser or someone who was comfortable with themselves would be one thing, kinda fun and kitschy – but the whole idea behind this fragrance just sorta escapes me. I'm not sure I'd personally go for “Sometimes I Play Dress-Up” either, but I sincerely think you've just written some house's next brief, and we're bound to see your riff on 'odeurs viriles' in ad copy in about a year or so. Ha, you're right… some might think that actually sounds so “French” and refined. I was just looking at the ELdO site and after reading the copy for “Don't Get Me Wrong Baby”, all I can say is, “OH, BROTHER!” There's a fine line between whimsy and downright … how should I say? … ridiculous! Joe: I know…good for a chuckle! I like your Sometimes I Play Dress-Up far more than the “real” thing- they ought to come to you for some new names! Will there be a women's version of “Sometimes I Play Dress Up”? I have two ideas- one possibility woudl be an homage to all the women of the world who may as well be drag queens, basically anyone names Joan. Do rhinestones and bugle beads have a scent? The other possibility would be to capture the emotional fallout of the deluded wife as she finds a ripped seam and her husbands chest hair in her favorite Nolan Miller gown. That would really have to smell like Scotch and soda, Virginia Slims and tears. I thought that already existed: Giorgio Red. Brilliant! Prior to this, I thought the ELdO line was campy fun, and I like the style (though not so much the content) of their graphics, but this Delicious Closet Queen nonsense is just so over the top and takes itself waaaay too seriously. Your review, on the other hand, was hilarious and fun. Love it! K: I am ready, hat in hand, to offer a sincere apology to your co-worker, who I'm sure is a true Lady in every sense of the word (photographic corroboration not necessary). I'm sure I admire the woman (not always a Texan) who can successfully wear Red, which in any case is far preferable, I'm sure, to DCQ. Your idea of Sometimes I Play Dress Up is far more entertaining… especially the rivulet trailing down into the nether regions. I've sniffed only two of this house's scents and neither one appealed – the Putain tried too hard and came out flat and the L'Air de Rien was such a foul chemical cocktail of urban modernity (and the complete opposite of “nothing”) it gave me a headache. Not sure I want to sample anything else. Though their graphics are at times amusing. I seriously think you should take your concept to a perfumer and make your own. The carnival/”Labyrinth”/”Phantom of the Opera” graphics…the obviously cosmetic smell (as described), something like “Moschino” or “Exclamation”…this poor dear went in the closet in 1987 and hasn't been out since. With violet leaf, tonka bean and citrus, I can just imagine some sobbing executive downing a box of truffles while wearing lipstick a' la Paloma Picasso. Leave cheap smelling stuff to the unenlightened blocks that would oppress, throw on a little rouge, some “Aqua Di Parma” or “Daim Blond” and hold court. I wear this fragrance – it's really very nice, but not for everyone. I believe you have to be pretty confident of yourself to carry it well and enjoy the sweet sexiness of this powerful fragrance. Go on, give it a try; if you dare! I tried this on today, and was thrilled to findout it is almost the same fragrance as one of my all time favorite discontinued fragrances….”Feeling Man” by Jilsander. Not quite as loud, but basically the same thing. Thanks ELd'O for offering a suitable relacement. Ah…lucky you Joe S.D. : I'm waiting for the same thing to happen for several discontinued scents….